Cefalu is a beautiful town just outside Palermo in Sicily. 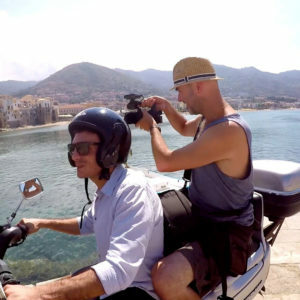 Joolzy Productions were invited to come and make a film about the surrounding area and what sort of day trips are available to people staying at Massimo Villas in Cefalu. So Julian McDonnell and Elexander Edward of Joolzy Productions teamed up with Nancy Jung from “Eat With Me Instanbul” to sample the delights of Sicily. Nancy is a chef, food blogger and wine lover who had a particular interest in the winery at Sant’Anastasia and the food market in Palermo, Ballaro. Our guide was Angelo who works at Massimo Villas as well as Marco, both of whom did a grand job of showing us much as we could see in a week. To book a stay at one of Massimo’s Villas visit www.massimovillas.com where one of the team (probably Angelo) will be able to help with anything you desire. Amongst the places we visit are Castelbuono which is famous for its square where they filmed Cinema Paradiso. In fact, Cinema Paradiso was filmed in Cefalu too. Castelbuono is a real traditional old Sicilian town up in the hills and is a short drive from the Vineyard at Sant’anastasia. Don’t forget to try their speciality “Manna” a sweet resin from a tree which has medicinal qualities. Cefalu itself is overlooked by an imposing rock “La Rocca” which provides a commanding view of the town, if you have the energy to climb it. If not, there is plenty to see in Cefalu. Just make sure you see the mosaic of Jesus in the cathedral because they are sure to ask you about it! And if you like this video and would like a film made just get in touch on our contact page. Or have a look at some of our other work here.